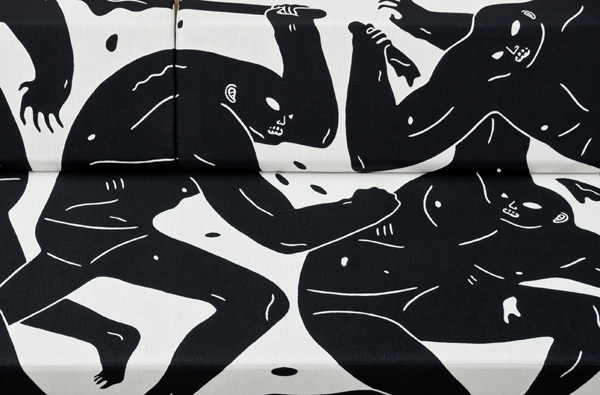 For the first time ever, LA artist Cleon Peterson’s savage imagery meets Modernica’s modern sensibilities in a wild new design – the Cleon X Modernica Case Study Daybed. The simple lines of Modernica’s V-Leg Daybed provide the perfect backdrop for Cleon’s bold black and white graphics. The Cleon X Modernica Daybed will be released on July 14th and available for purchase on the Modernica website or in our Los Angeles Showroom. The inspiration for Cleon Peterson’s tumultuous imagery stems from the chaos and violence that exists in today’s world. This dark side that lives within us all acts as a mirror; looking at our own reflections can have the power to inspire change.